Background: Metformin is recommended in most clinical guidelines as a firstline oral anti-hyperglycemic drug to treat type 2 diabetes. 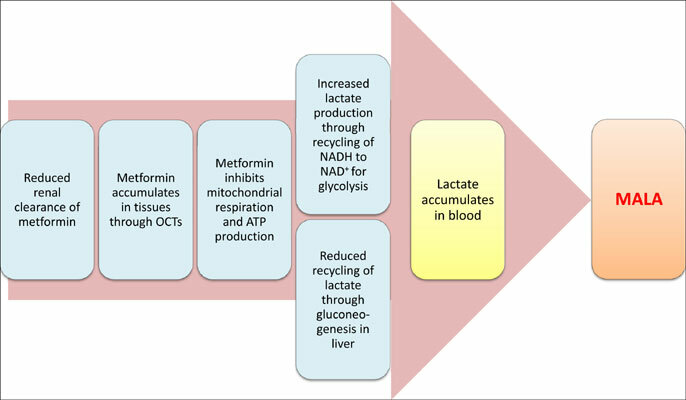 Despite its effectiveness as an anti-hyperglycemic agent, certain genetic variants and conditions may cause metformin accumulation in the body and lead to lactic acidosis- a condition commonly known as Metformin Associated Lactic Acidosis (MALA). Though the incidence of MALA is relatively rare, it is potentially fatal with a mortality rate of 30 to 50%. The mechanism of MALA is not well defined yet. Method: In this study, we explored the molecular mechanism of MALA following an in silico approach. We applied structure modeling and molecular docking tools to predict interactions of metformin with different human Organic Cation Transporters (OCTs) as well as the Complex I of the mitochondrial Electron Transport System (ETS). Results: Molecular docking analyses suggest potential interactions of metformin with the core subunits of the human ETS Complex I that are essential for its function. In silico analyses suggest that metformin can bind to the pores of 8 different OCTs, which are expressed in different organs. Conclusion: Based on these predicted interactions and organ specific gene expression data in the databases, we present here a model to explain the molecular mechanism of MALA. Organic cation transporter, metformin, metformin associated lactic acidosis, type 2 diabetes, electron transport system, Complex I.